Papastergiou, M. (2006). Course Management Systems as Tools for the Creation of Online Learning Environments:Evaluation from a Social Constructivist Perspective and Implications for their Design. 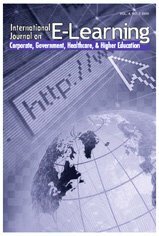 International Journal on E-Learning, 5 (4), 593-622. Waynesville, NC USA: Association for the Advancement of Computing in Education (AACE). Retrieved April 25, 2019 from https://www.learntechlib.org/primary/p/6084/.